Morris is the county seat of Stevens County. It's a college town--the University of Minnesota-Morris has received national recognition for its academically gifted student body, commitment to diversity, green campus initiatives and emphasis on student leadership. It's ranked among the top four colleges for its student-to-faculty ratio of 12 to 1. And it was recently ranked among the top 100 colleges nationally as a best value for both in-state and out-of-state students in the 2008 Kiplinger Best Values in Public Colleges exclusive survey. Morris is also a farming community, it's surrounded by some of the most fertile land in Minnesota. It's dairy country, too. Doug Ehlers and Patty Kill from First Federal Savings Bank work with a lot of the farms and their employees. They kindly acted as tour guides for two WCI staffers. First stop is La Tienda, a grocery store catering to the Morris area's Latino residents. The dairy farms and a few other large local businesses employ close to 200 immigrant workers. Most are in Minnesota without their families, but about 10 Latino families make their home in the area now. La Tienda stocks many of the comforts of home. There's also a classroom upstairs where Morris Community Ed provides English language lessons. A few miles out of town, the countryside is greening up nicely. The first crop of alfalfa will be ready for cutting soon. 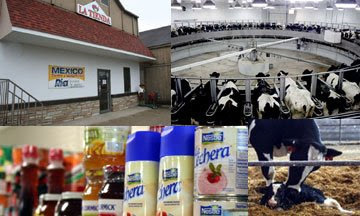 Riverview Farms owns several dairy facilities in the area. And they are big. Each farm holds about 5,000 head of cattle. Milking is round the clock and an exact science. At one farm, cattle are herded onto a huge circular conveyor that holds close to 100 cows. The cows move into individual stalls, workers attach the milking machines, and the cows take a 10-minute ride before the milking apparatus is detached and they can saunter back to the barn for a well-deserved meal. The barns also have a maternity ward where 50 to 60 calves are born EVERY DAY. Nothing is wasted at Riverview Farms. Solids are separated from manure and dried to create bedding for the cows. The liquid can be pumped into nearby fields as fertilizer for crops. And that's not all. Soon a "digester" will be up and running that will create methane gas from the manure, which in turn will be sold to the local power company. One more stop: Buddies in the small burg of Hancock for lunch. If you've got a huge hankering for a hamburger, the double-decker Buddy Burger is sure to appease your appetite! See photos of the Morris Road Trip.